WASHINGTON – President Donald Trump’s global trade war is posing a growing risk to the kind of robust job gains that the U.S. probably enjoyed again in June. Data due Friday from the Labor Department cover the first weeks since the U.S. imposed steel and aluminum tariffs on some of its larger trading partners, with financial markets whipsawing on the latest trade developments and likely becoming more sensitive to disappointing economic figures. What’s more, companies including motorcycle maker Harley-Davidson Inc. and auto manufacturer General Motors Co. have warned of potential U.S. job losses because of Trump’s trade policies or retaliatory levies. While analysts say June is too early to see significant fallout from trade tensions in the employment data, such forces are starting to emerge as a possible counterweight to the tax cuts buoying corporate investment and consumer spending – and boosting a labor market that’s shown little sign of slowing. 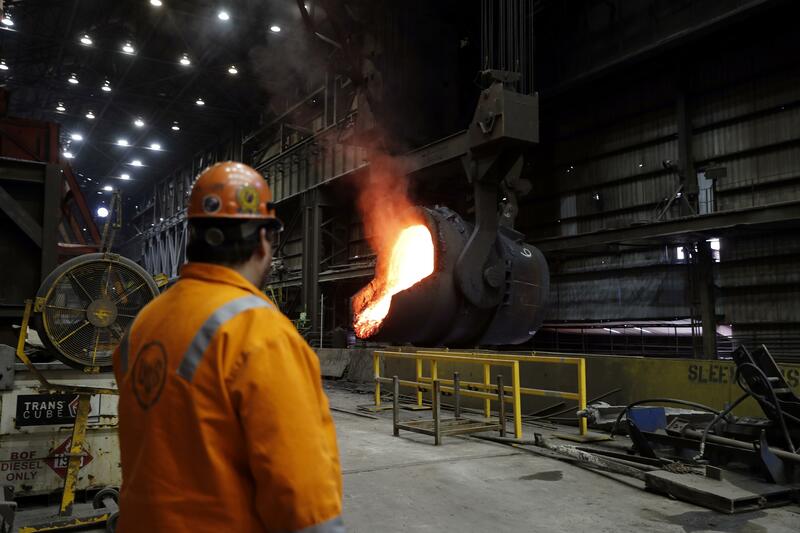 Yet anecdotal worries are mounting, with a U.S. factory survey on Monday showing executives “overwhelmingly concerned” about tariffs and two regional Federal Reserve presidents warning last week that a trade war is increasingly weighing on businesses and adding risks to the outlook. “For now, the underlying fundamentals are strong enough and the stimulus the economy is receiving from fiscal policy is large enough to outweigh the uncertainty from protectionism,” said Michael Gapen, chief U.S. economist at Barclays Plc in New York. If there’s a marked slowdown in employment, particularly in manufacturing jobs, it would indicate that “the business sector may have gone on hold with its investment and hiring plans given the noise around protectionism.” Even so, Gapen said he expects any such impact to show in July at the earliest. Those looking for early signs of a trade war will be eyeing manufacturing, which is already being buffeted by the tariffs that are in effect or about to be imposed. The median estimate of economists for a gain of 15,000 jobs in the sector last month, following 18,000 in May, would be the weakest showing since September, when hurricanes hampered production. The question is whether markets would read such cooling as an early sign of business uncertainty or a natural slowdown in a sector that saw jobs boom for eight months. Jeremy Schwartz, a U.S. economist at Credit Suisse, sees it as the latter. While factory executives have been worried about the effect of trade tariffs on prices and already-constrained supply chains, when it comes to employment the shrinking pool of skilled workers remains a paramount concern, according to the Institute for Supply Management. Tariffs may even be spurring at least temporary boosts in demand and aggravating bottlenecks, as an index of supplier delivery times rose in June to the second-highest level since 1979. Some slowing, unrelated to tariffs, may also make sense as global economic growth shows signs of cooling and monetary policy becomes less of an engine supporting expansion, according to Jim Paulsen, chief investment strategist at Leuthold Group in Minneapolis. While some Fed officials have relayed concerns over the negative impact of tariffs, they’re also watching the wage figures for any sign inflation will drift further above the central bank’s 2 percent target. An monthly gain of 0.3 percent or more in June, the median estimate of economists, could signal strengthening inflation, according to George Goncalves, head of Americas fixed-income strategy at Nomura Securities International Inc. That, in turn, would reinforce market expectations for higher interest rates, and drive the 10-year Treasury yield back up toward 3 percent. Paulsen said one outcome on the employment data that could throw financial markets for a loop would be faster-than-expected wage gains, such as a 3 percent annual rise, in concert with weaker-than-forecast payrolls. Published: July 3, 2018, 2:49 p.m. Updated: July 3, 2018, 7:54 p.m.